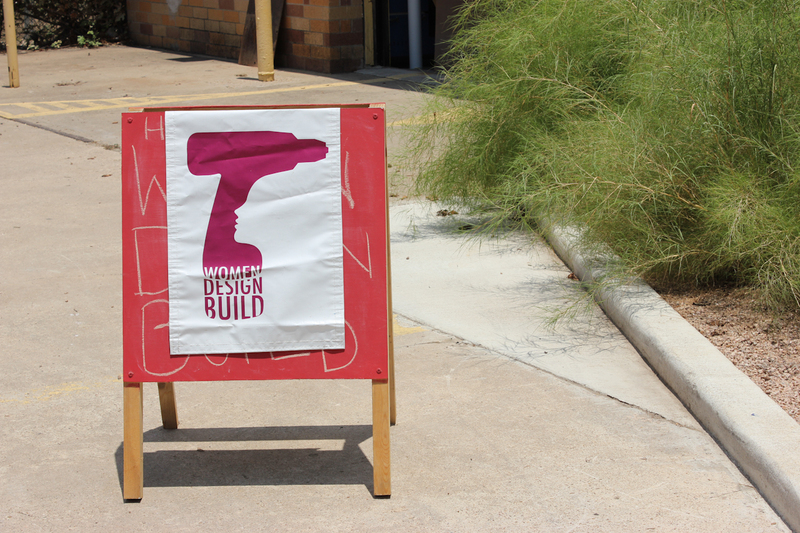 Last weekend, I attended another event sponsored by Women.Design.Build. 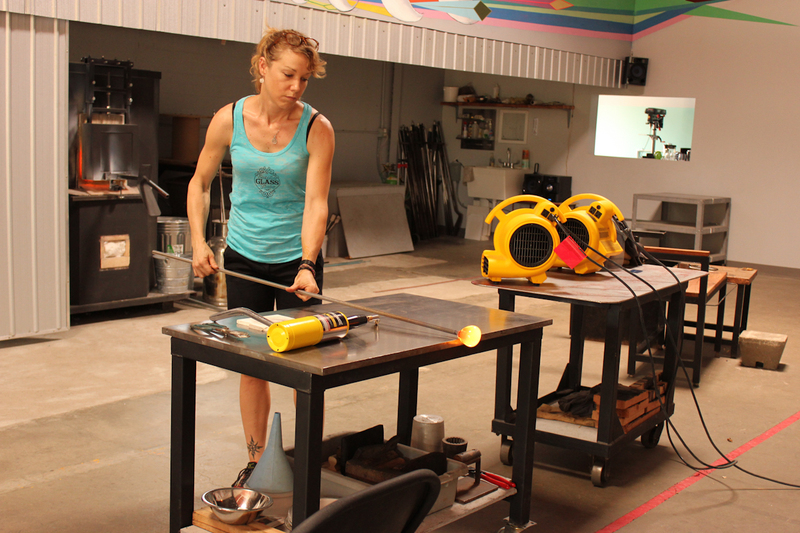 This time it was a glass sculpting class at East Side Glass Studio. 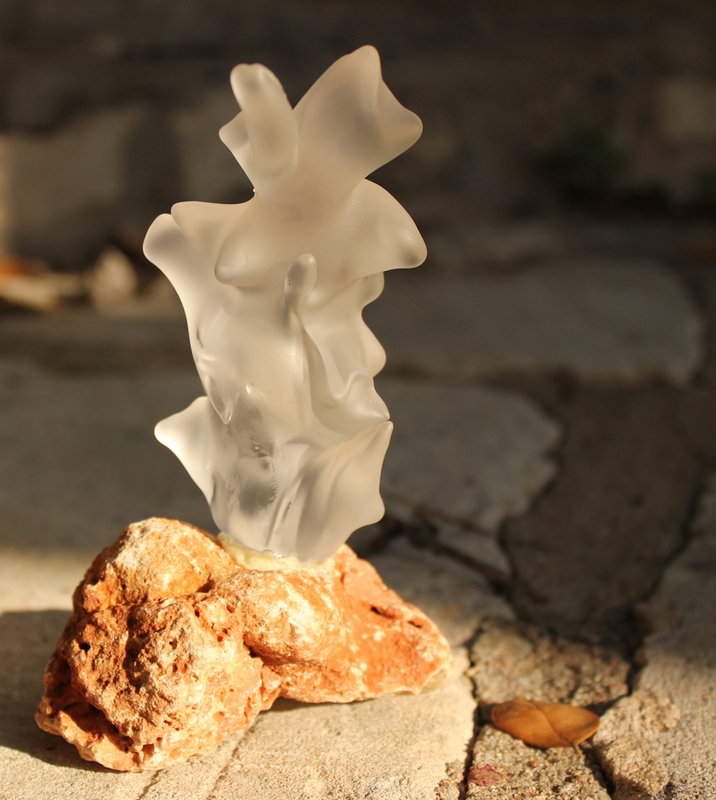 What exactly is glass sculpting you ask? Well, I also didn’t know until I did it myself (with a lot of help). East Side Glass is conveniently located next to Hops & Grain Brewery and they are often open at the same time on Saturdays, advertising the afternoon as “Hot Glass, Cold Beer” because you can taste some beer in the taproom and watch a glass blowing demonstration in the studio, all in the same day. Which is all to say, OF COURSE I sampled some beer before heading to the glass sculpting event. 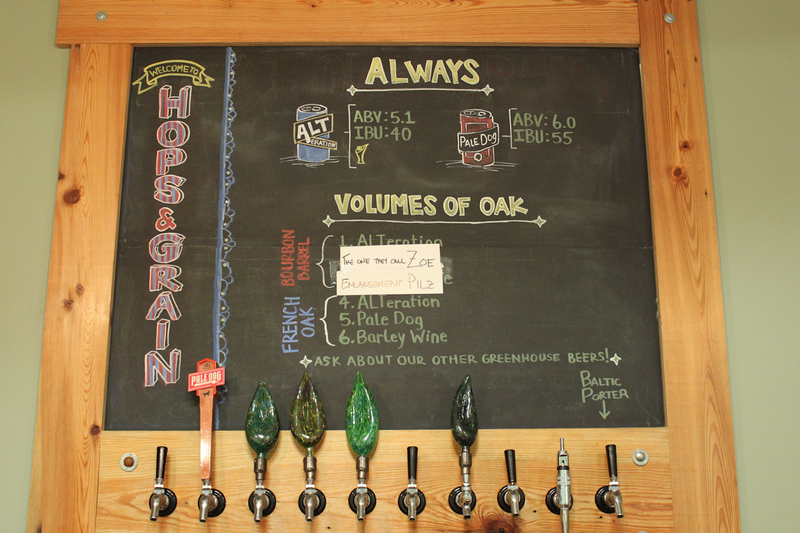 All the beers to choose from at Hops and Grain. Look at those cool glass tap handles! After sampling the beers, we all headed over to the East Side Glass Studio where Christina from Women.Design.Build kicked off the event. 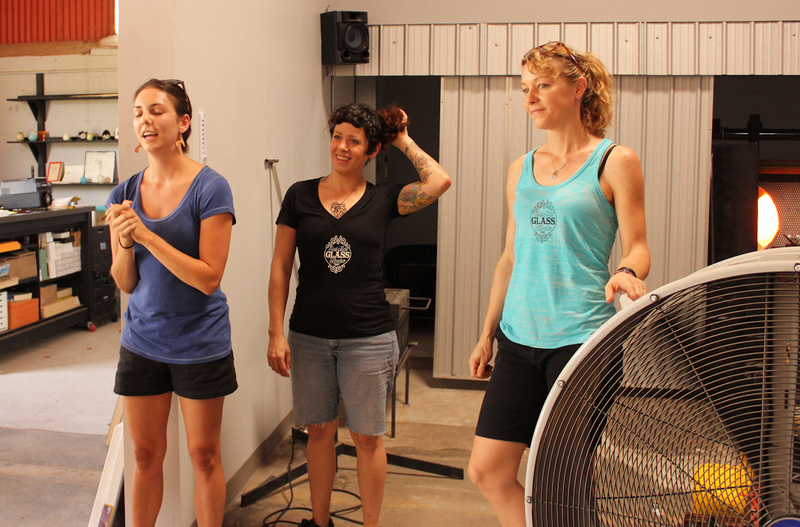 Christina (left) from Women.Design.Build and Shara (middle) and Leigh (right), owners and operators of East Side Glass. 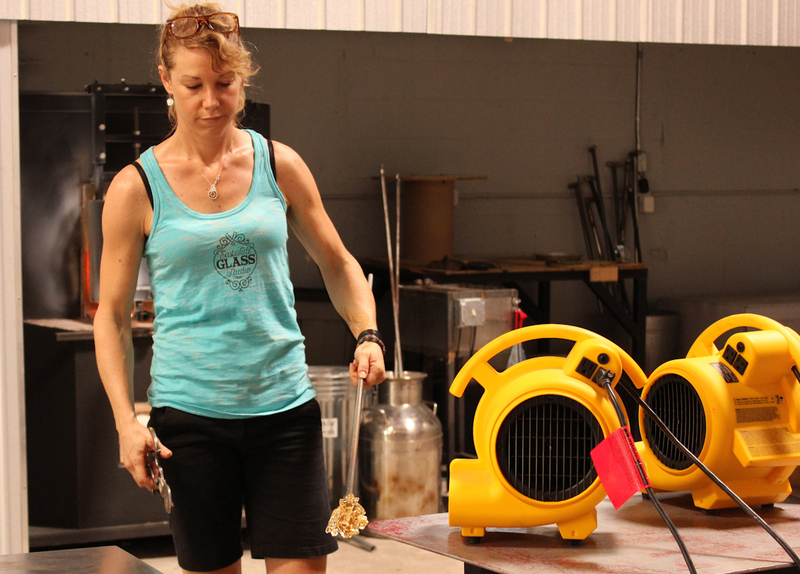 We started out with a demo from Leigh and Shara showing us what they would do to get our glass ready to be “sculpted” and how we would actually sculpt the glass with large metal shears. 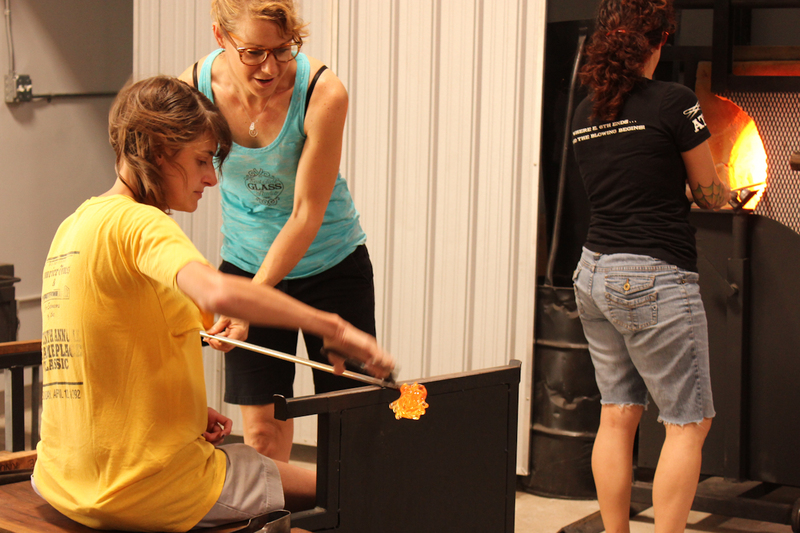 After that, we all took turns in the hot seat snipping away at our glass creations. 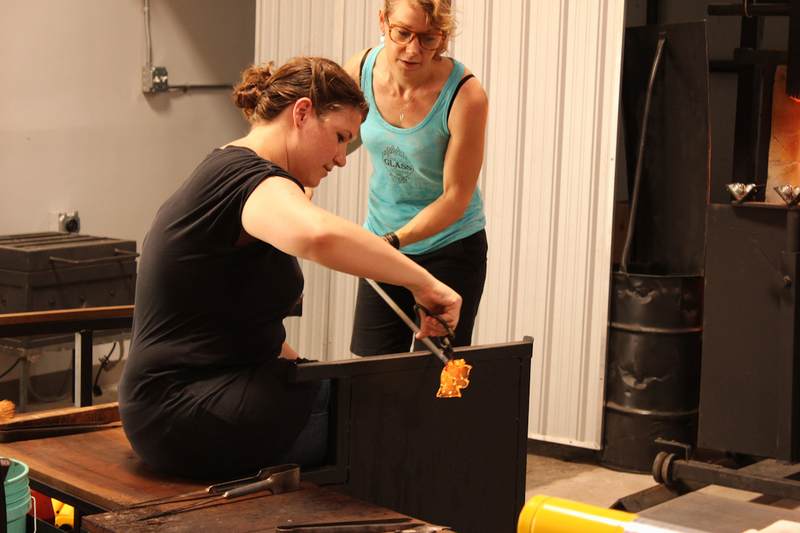 After getting enough molten glass at the end of a metal rod, Leigh and Shara would use the table to turn the molten glass so that it would have a nice globe shape. You’ll notice the two giant fire-filled ovens on the side of the studio. I’m not entirely sure what they were for, but it seems one was used when first creating the molten glass and the second was used after the molten glass had started to cool a bit and they needed to heat it back up. 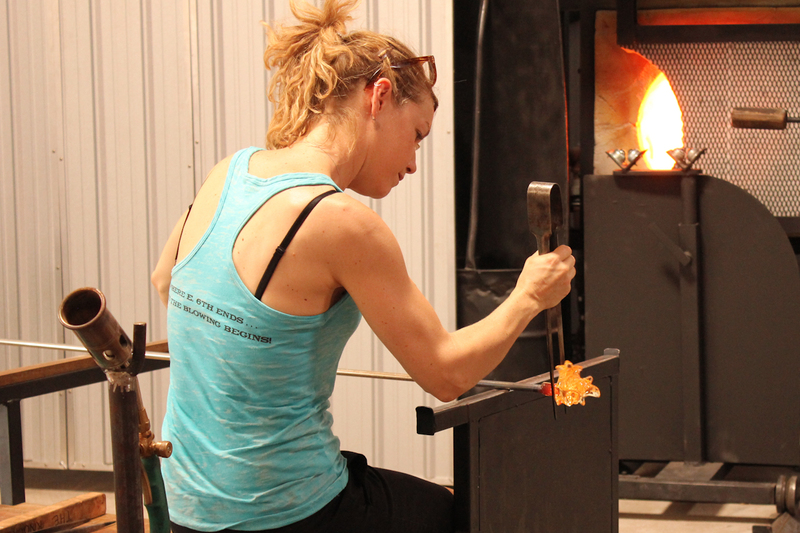 Leigh turns the molten glass at the end of a metal rod so that it will have a round shape. 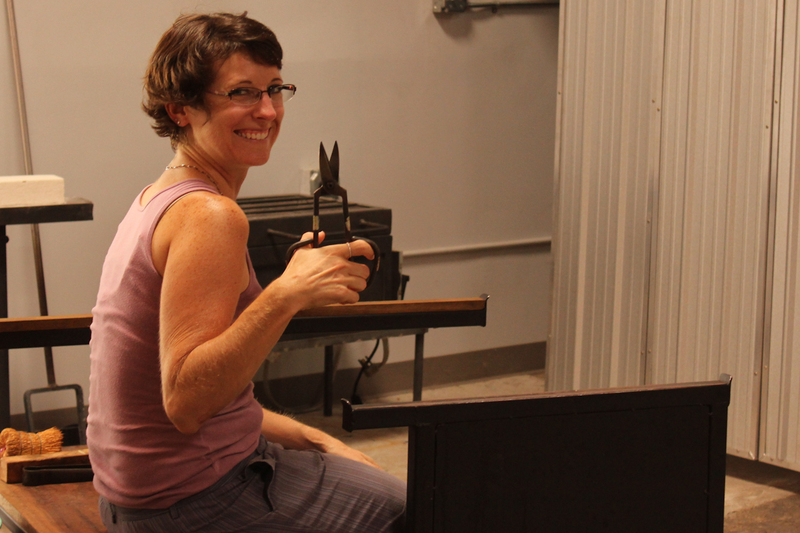 While the molten glass was being prepared, one of the workshop participants would assume the “hot seat” and grab the large metal shears. Shara or Leigh would bring over the molten glass for each of us to cut away at. While we cut it, they continued to rotate the rod so that the glass would not fall over to one side. It kind of reminded me of toasting marshmallows – when they were gooey inside you had to spin the stick to keep them from falling off. Got my shears, ready to sculpt! Kristen from MakeATX snips away. 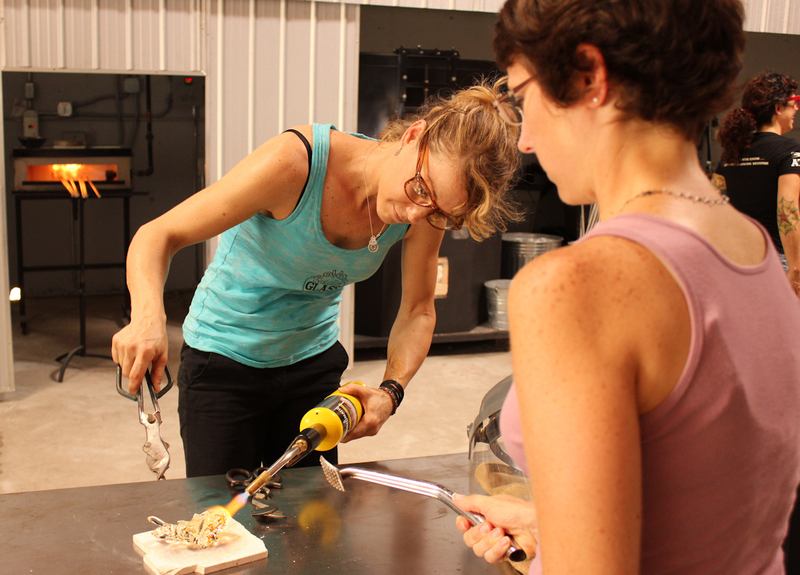 After we were done sculpting, Leigh and Shara would heat the glass a bit more and then use some sort of large tweezer looking tool to start to remove the glass from the rod. 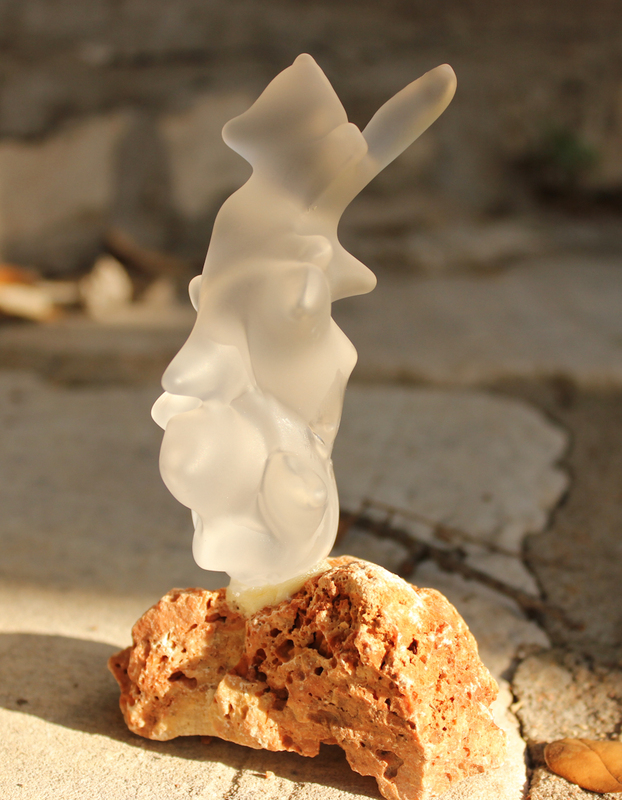 Leigh starts the process of removing the glass sculpture from the rod. Then, they would heat it again and use some clippers to further crimp the glass on the rod and then cool it a bit in front of a fan. Glass being cooled by a fan. Next, they placed the glass on the table, knocked the rod with something metal and the glass sculpture would break off in a controlled fashion. They heated up the breakage point with a torch and then we used something they called a brake pad to smooth out any rough edges. Ready to apply the brake pad. 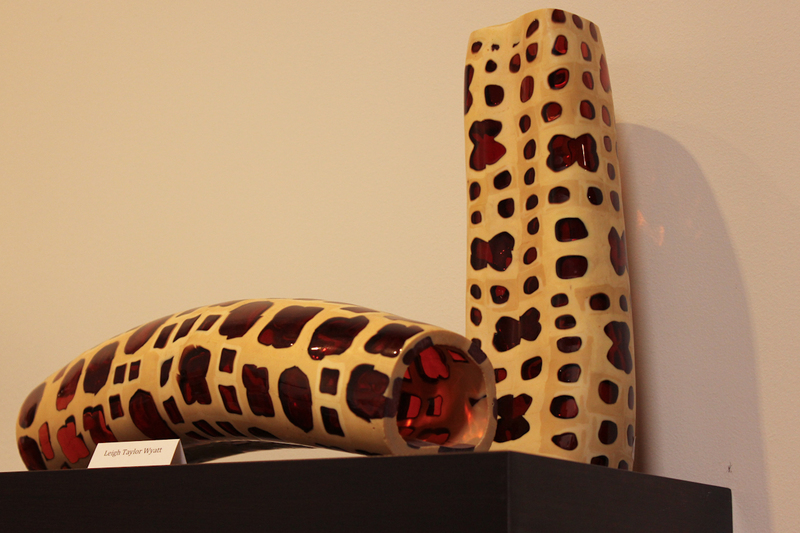 My glass sculpture ended up being long and thin. I think it looks like a piece of coral. After using the brake pad, Leigh and Shara donned large oven type mitts and covered up exposed skin so that they could place the glass in a super hot oven. The oven started at something like 970 degrees and slowly brought the temperature down so that the glass wouldn’t crack. Glass doesn’t appreciate large temperature changes. After I brought my sculpture home, I decided that in order to display it in its best light, I needed to mount it to something. After a bit of brainstorming and some ideas from my husband, I found an appropriately sized orange rock from our landscaping to use with the glass sculpture. After cleaning the rock I used gorilla glue to attach the glass to the rock and used a rubber band to hold the pieces together while the glue dried. Gorilla glue expands as it dries so after it was cured, I used a box cutter to cut off the extra glue. I think I might use my water colors to give my sculpture a bit of pastel color down the road so that it matches the room that I end up displaying it in. 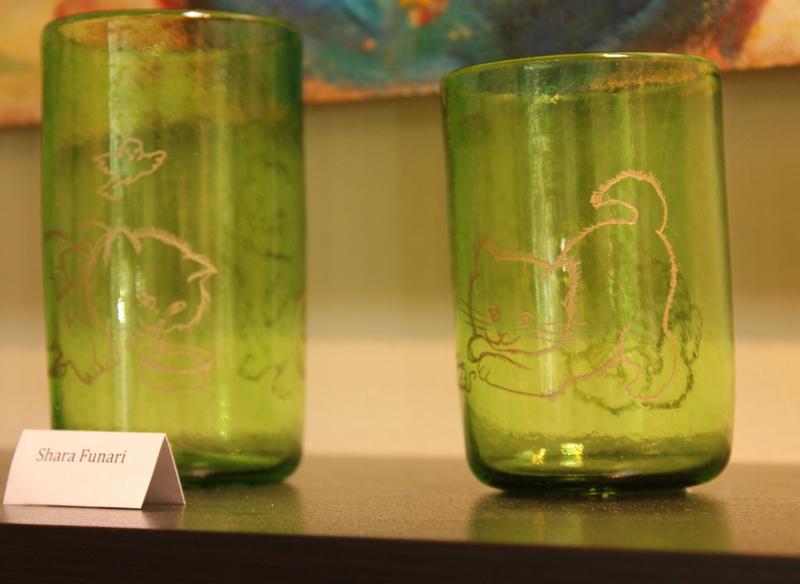 While at the workshop, I took some time to browse the studio where Leigh and Shara display their glasswork. I saw many awesome pieces, so I encourage you to check it out sometime! Kitty glasses! Kitties are the best. Awesome glass sculpture. Love the tribal feel to it. 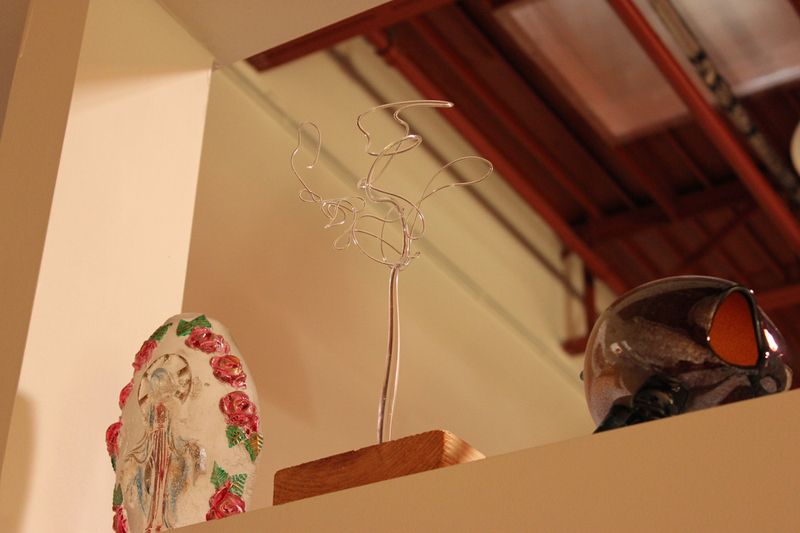 Very delicate glass tree, set on a shelf way above my head. I just love the shape.